Climate Council CEO Amanda McKenzie, speaking on Q&A. In relation to this article responding to Climate Council CEO Amanda McKenzie’s claim that heatwaves are “worsening” and “hot days” have doubled in Australia in the last 50 years, a spokesperson for the Climate Council gave the following responses. Questions from The Conversation are in bold. Could you please provide a source, or sources, to support Ms McKenzie’s statement that heatwaves are “worsening” and hot days have doubled in the last 50 years? Climate change is making hot days and heatwaves more frequent and more severe. Since 1950 the annual number of record hot days across Australia has more than doubled and the mean temperature has increased by about 1°C from 1910. Specifically, there has been an increase of 0.2 days/year since 1957 which means, on average, that there are almost 12 more days per year over 35°C. What did Ms McKenzie mean by the terms “heatwaves” and “hot days”? Hot days – the number of hot days, defined as days with maximum temperatures greater than 35°C. Heatwaves – three days or more of high maximum and minimum temperatures that is unusual for that location. Furthermore, heatwaves have several significant characteristics. These include (i) frequency characteristics, such as the number of heatwave days and the annual number of summer heatwave events; (ii) duration characteristics, such as the length of the longest heatwave in a season; (iii) intensity characteristics, such as the average excess temperature expected during a heatwave and the hottest day of a heatwave; and (iv) timing characteristics, including the occurrence of the first heatwave event in a season. Is there any other comment you would like us to include in the article? Climate change – driven largely by rising atmospheric carbon dioxide concentrations from the burning of coal, oil and gas – is increasing temperatures and cranking up the intensity of extreme weather events globally and in Australia. The accumulating energy in the atmosphere is affecting all extreme weather events. Climate change is driving global warming at a rate 170 times faster than the baseline rate over the past 7,000 years. Temperature records tumbled yet again during Australia’s ‘Angry Summer’ of 2016/17. In just 90 days, more than 205 records were broken around Australia. Heatwaves and hot days scorched the major population centres of Adelaide, Brisbane, Canberra, Melbourne and Sydney, as well as the rural and regional heartlands of eastern Australia. The most severe heatwave of this Angry Summer began around January 31 and continued until February 12, with the highest temperatures recorded from February 9-12. This heatwave was made twice as likely to occur because of climate change, while the extreme heat in New South Wales over the entire summer season was at least 50 times as likely to occur because of climate change. The severe heatwave of February 2017 that spread across much of Australia’s south, east and interior caused issues for the South Australian and New South Wales energy systems. In New South Wales around 3,000MW of coal and gas capacity was not available when needed in the heatwave (roughly the equivalent of two Hazelwood Power Stations). In South Australia, 40,000 people were left without power for about half an hour in the early evening while temperatures were over 40°C. This heatwave highlights the vulnerability of our energy systems to extreme weather. The release of the Finkel report has refocused national attention on climate change, and how we know it’s happening. 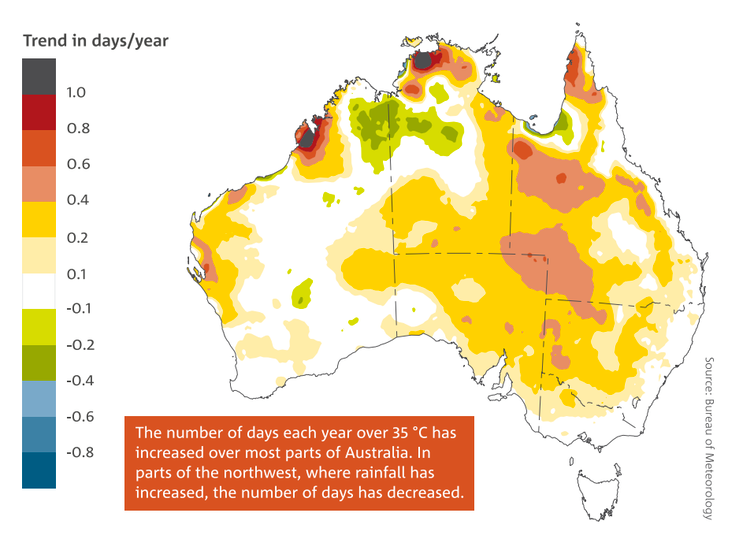 … worsening heatwaves, hot days doubling in Australia in the last 50 years. Excerpt from Q&A, June 12, 2017. Quote begins at 2:12. Her comment provides the perfect opportunity to revisit exactly what the research says on heatwaves and hot days as Australia’s climate warms. You can read full response from the Climate Council here. How do we define ‘heatwaves’? A period of at least three days where the combined effect of excess heat and heat stress is unusual with respect to the local climate. Both maximum and minimum temperatures are used in this assessment. The BOM uses a metric called the “excess heat factor” to decide what heat is “unusual”. It combines the average temperature over three days with the average temperature for a given location and time of year; and how the three day average temperature compares to temperatures over the last 30 days. We can also characterise heatwaves by looking at their their intensity, frequency and duration. 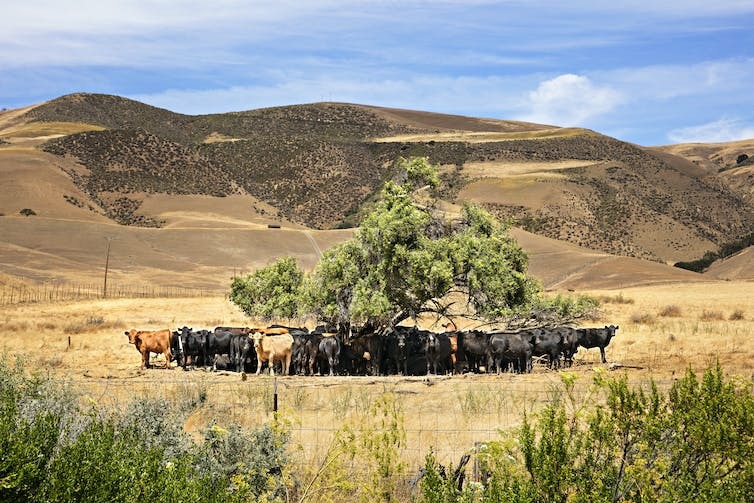 Researchers, including Australian climate scientist Dr Sarah Perkins-Kirkpatrick, are trying to standardise the definitions of “heatwaves” and “hot days” and create a framework that allows for more in-depth studies of these events. There’s not a large body of research against which to test this claim. But the research we do have suggests there has been an observable increase in the frequency and intensity of heatwaves in Australia. 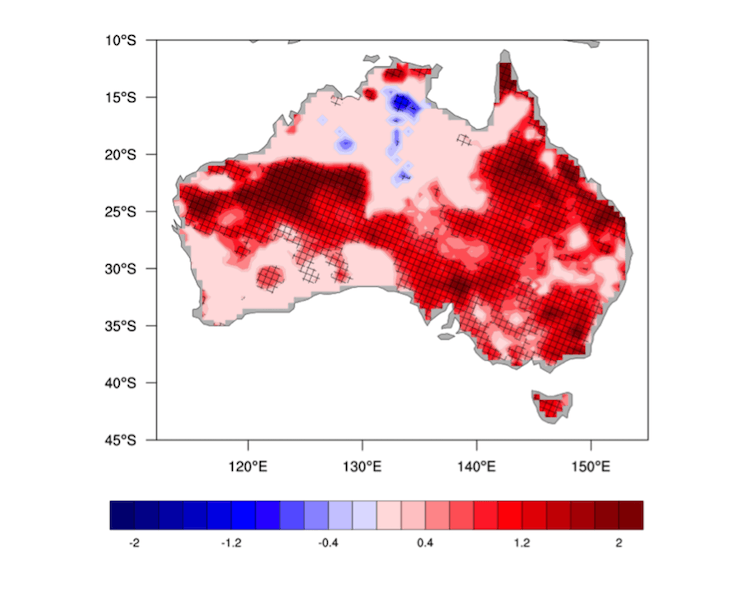 Research published in 2013 found a trend towards more heat waves in Australia between 1951 and 2008. A review paper published in 2016 assessed evidence from multiple studies and found that heatwaves are becoming more intense and more frequent for the majority of Australia. We’ve seen a trend towards more heatwave days over Australia. Trends are shown for 1950-2013 in units of heatwave days per decade. Stippling indicates statistical significance at the 5% level. 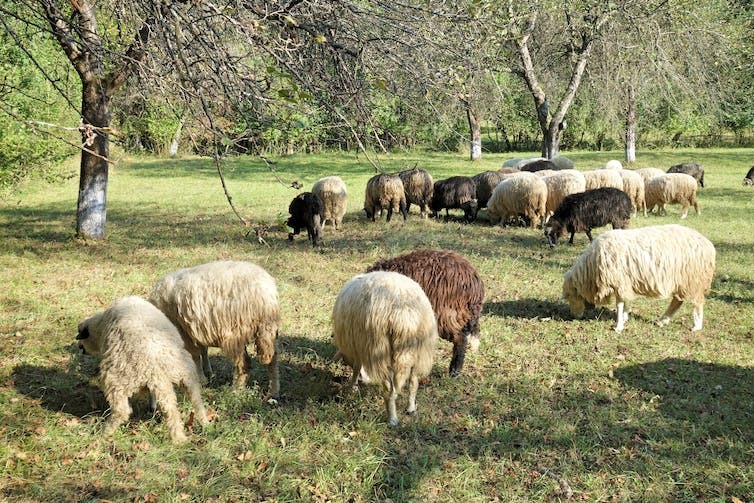 Have hot days ‘doubled’ in the last 50 years? 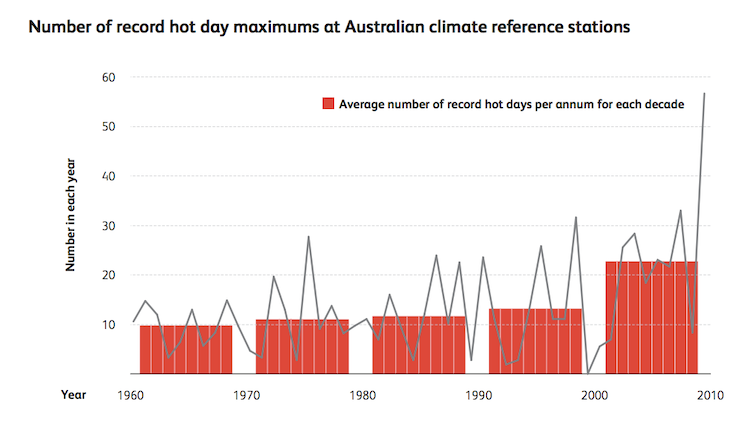 While the number of “hot days” (as defined by the BOM) has not doubled over the last 50 years, as McKenzie said, the number of “record hot days” certainly has. “Record hot days” are days when the maximum temperature sets a new record high. Given that McKenzie made her statement on a fast paced live TV show, it’s reasonable to assume she was referring to the latter. Let’s look at both figures. The BOM defines “hot days” as days with a maximum temperature higher than 35°C. The BOM data show there were more hot days in Australia in 2013, 2014, 2015 and 2016 than in any of the 50 years from 1966 to 2016 (the last year for which data are available). In fact, there were more hot days in the years 2013-2016 than in any other year as far back as 1910. If we compare the decades 1966-76 and 2006-16, we see a 27% increase in the number of hot days. A 2010 Bureau of Meteorology/CSIRO report found record hot days had more than doubled between 1960 and 2010. That data was collected from the highest-quality weather stations across Australia. Number of record hot day maximums at Australian climate reference stations, 1960-2010. Number of days in each year where the Australian area-averaged daily mean temperature is extreme. 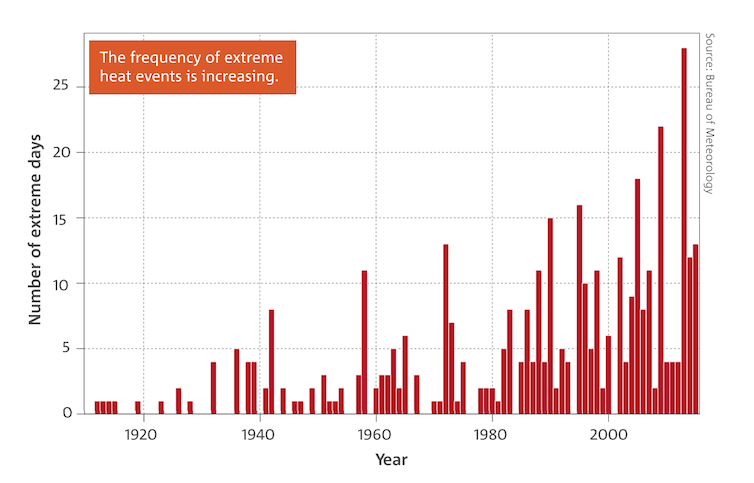 Extreme days are those above the 99th percentile of each month from the years 1910-2015. Why are heatwaves worsening, and record hot days doubling? The trend in rising average temperatures in Australia in the second half of the 20th century is likely to have been largely caused by human-induced climate change. Recent record hot summers and significant heatwaves were also made much more likely by humans’ effect on the climate. The human influence on Australian summer temperatures has increased and we can expect more frequent hot summers and heatwaves as the Earth continues to warm.